Blacksmith and volunteer extraordinaire Robin Butler turned 80 on Saturday 27th March. Robin had expressed his wish to spend his birthday at the museum, doing what he does best -blacksmithing! A lovely day was had by all and there was a big crowd to celebrate the event. Many local blacksmiths attended the party and each made a nail in the museum's forge which was then banged into the wooden 'birthday cake'. Below are two videos of the day, one showing some of the blacksmithing which took place and the other of the festivities in Fat Betty's. Many lovely photos were taken too so there's also a slideshow. A big blog post for a big birthday! Still busy with Easter stuff. Not long now! (HELP!!!) I have just sent an email to the Gazette and Herald to advertise our weekend so make sure you have a look. 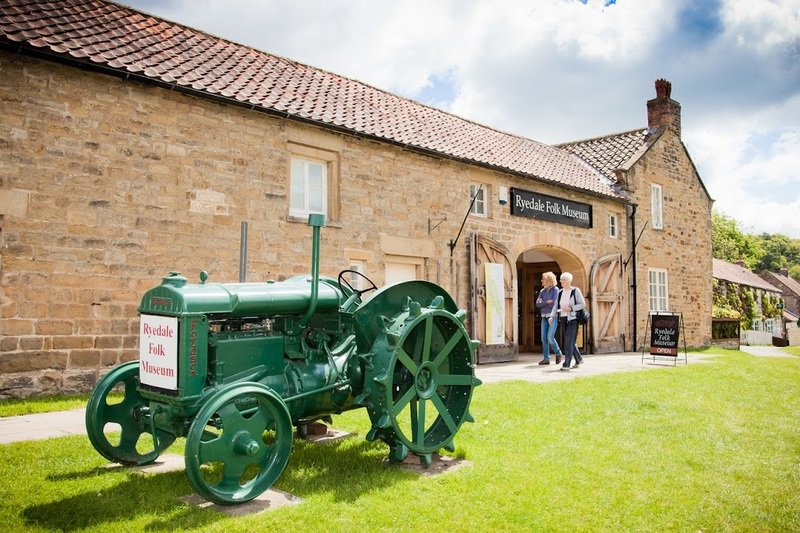 We have lots of exciting activities for all the family taking place over the two weeks of Easter here at the museum.Festivities begin on Good Friday. We have World War 2 re-enactors on site and they will be here throughout the Easter Weekend. There will be Egg decorating on Good Friday and an Egg Rolling competition on Easter Sunday. Guess the weight of the Simnel Cake will be judged on Easter Sunday and we have a raffle running throughout the two weeks which will be drawn on Sunday, 18th April. The following two weeks we will be full of a range of different activities taking place within the Museum. These include: Treasure Hunts, Cooking, Crafts, Spinning, Weaving as well as refreshments being served in the warm seating area. Hopefully this will be in Thursday's Gazette. Easter should be great fun. I will look forward to seeing YOU!!! I have been finding it very hard to think of things to do on the spot... so I have asked Emma (my supervisor) if I can do a work sheet and write in the things I have to do each day - this was such a good idea that Bex (Emma's supervisor) made Emma do the same... now I'm not walking in circles to think of things to do. Recently I have been helping Emma with her Easter Events and trying to ring different people to see if they could come and help us, and if so what days they can do, etc. I have sent some leaflets with a signed off letter, saying that the museum was sorry for the delay of not receiving any leaflets. I have started to research some Tudor Games and Victorian Games, for when a school group comes down and shows its interests in something to do over the lunch break. It is something for the kids to learn over the lunch break, and also it keeps them entertained over the hour. The Bric-a-Brac is still out and we are desperatly trying to get rid of it all, as we always get so much given to us as a donation. Giant Chicken Seen in Village!!! A giant chicken has escaped from Ryedale Folk Museum and been spotted roaming around a nearby village! I have been very busy over the past few weeks. So much has been happening. 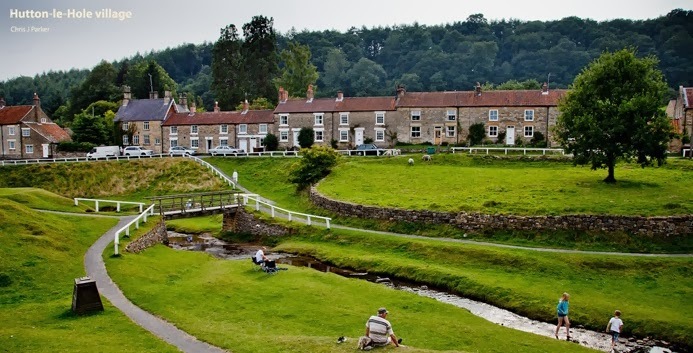 Firstly David and I have been to Beck Isle Museum. I found this rather useful. I have been to Thirsk with Helen doing a Stock Exchange. This was a great opportunity to meet new people and telling everyone what the Museum has to offer. At the moment I am really busy organising Easter which is taking place over the Easter Holidays. Activities start on Good Friday and finish on the 18th. If anyone is free over Easter come along. You will have an "Eggcellent" time!!! Or if you would like to help out over Easter you can send me an E - mail. apprentice2@ryedalefolkmuseum.co.uk. Or you can ring the Museum. 01751 417367. Yesterday, I went to Anne Lancaster's house and I had a really good time doing Crafty stuff. Anne is AMAZING!!! If anyone happens to be free one day go to her house!!! Anne may be coming to the Museum over Easter to help out with the Crafts. That will be great. Well I look forward to seeing everyone soon. The final part of Edward Harrison's demonstration of Fire making equipment and objects from the collection. This video looks at the fascinating variety of matches which were available in the early years of the invention, the unusual and rare Dobbereiner Lamp, and some amusing novelty match holders. Further fascinating objects relating to fire making from the Harrison Collection. Narrated by Edward Harrison, this video looks at some unusual fire making implements as well as the simple yet beautiful fire glass. Recently we have done a hygiene course, and we have just got our certificates now and have found out we have passed, :) yay!! Erm, Mike says we are snakes because I said that their displays are better, but then I realised that they weren't... they were only different because with theirs they can be looked at and seen, ours we take the risk of trusting people to be careful as they look and touch it. I have been helping Emma Boyes with her Easter Event and that WAS FUN! She has been trying very hard to get people in but everyone seems to have family over to stay so she is finding it hard! - but i think it will be a great 2 weeks!! Emma has asked me to do some cooking in the 'Crofters Cottage' and i dunno what to cook? I'm thinking of doing something simple like a stew or somethin' especially as i haven't been in there before. We have done some front of house work, and gotten to grips with our ability to master the till!!!! Our Tutor - Rolf, came to us on a Saturday, and I was still in bed when he called, because he got the wrong date!! But Oh well?!?!?! Emma and I have cleaned out the 'Study Centre' cabinet.... WHAT A DIFFERENCE!! Labels: Easter event, F.O.H., Hygene course, Rolf, Stock Room, Study Centre. Once again Edward Harrison was kind enough to talk me through some of the huge Harrison Collection. One of Edwards favourite subjects within the collection is fire-lighting. The collection contains a huge array of ingenious devices to light fire. Fantastic inventions as well as basic essential devices such as the tinder box. See the video below for a brief look at just some of the objects. 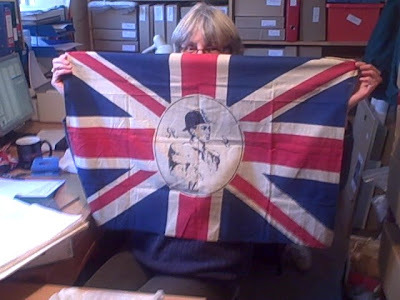 This Union Flag was kindly donated to the museum by Peter Brears the food historian and author. The flag is in remarkably good condition and dates from the 1930's. It is being held by the museum's collection manager Helen. On Monday 8th of March some volunteers used traditional wheelwrighting methods to hoop a wheel at the Museum. Have a look at the video below to see them in action. Visitors to the museum also enjoyed watching the volunteers at work.